SAMAR allows manufacturers, importers, builders, banks, insurers and the public to control title and ownership of movable assets. SAMAR’s use by the insurance industry to load their interest against the asset under finance will reduce risk for the banks and related costs. SAMAR covers the life-cycle of an asset, and creates the most recent reliable record of an asset by updating records as changes are made by system interactions. Property identification is essential for both financiers, and insurers. The total value of non-motor related movable assets financed and insured, is substantial. The identification of these assets in instances where the purchaser owing, and/or in instances of loss due to theft, is problematic for both financier and insurer. Due to lack of the marking of movable assets other than roadworthy and registered vehicles, Millions of Rand per year is lost. A SAMAR High Security Label (HSL), is attached to each asset loaded onto SAMAR. The HSL, contains a unique asset reference number, which remains with that asset for its lifetime. The label incorporates a number of features that make it difficult to copy and the asset number is also contained in the barcode as a failsafe mechanism. 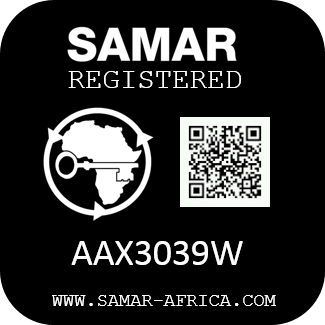 The SAMAR logo is currently in the trademark registration phase – so any infringements and attempts to copy will be prosecuted. In order to drive SAMAR adoption, a mobile app will be available for download by anyone. This app will not require any registration for use and will be available on the Android platform initially. Any user of the SAMAR app will be able to scan the SAMAR High Security Label and view limited details in relation to the asset. The details supplied via this mobile interface to the public will be limited so as to ensure POPI compliance. In 2011 the IPPP committee, instructed the NRCS to adhere to legislation and stop providing eNaTIS model numbers for those vehicles prescribed in Regulation 5. The vehicles so prescribed are vehicles not designed for public road use, in other words, vehicles that cannot legally pass a roadworthy test. SAMAR allows manufacturers, importers, builders, banks, insurers and the public to control title and ownership of movable assets that would in time allow for improved control over movable assets in the Users of the system can anticipate improved availability of personal and commercial financing of movable assets. Property identification is essential for both financiers, and insurers. The total value of non-motor related movable assets financed and insured, is substantial. The identification of these assets in instances where the purchaser owing, and/or in instances of loss due to theft, is problematic for both financier and insurer. MIBTrack from BBRTC (Pty) Ltd, is a control solution for the introduction of models for Vehicle Manufacturers, Importers and Builders (MIBs), as well as their dealer network, in the South African market. The Manufacturer, Importer and Builder Tracking System keeps track of vehicles from manufacture/import, through introduction to eNaTIS, allocation to dealer, up to first registration. The system allows for interaction between dealership and OEM to confirm that the vehicle information was captured correctly before the release for first registration takes place.